Pikado is a design toy that was born of the collaboration between Mon Petit Art and argentine artist Gonzalo Arbutti. What a funny object! It seems to come from another planet… nevertheless, it was inspired by nature, and, more precisely, by burdock seeds. You certainly know those little spiky balls that keep stuck on your clothes after a walk in the woods or in the countryside. Those little plants entertained Gonzalo Arbutti so much that he made a giant game based on their hooks system: the Pikado ! Gonzalo Arbutti used his favorite material, wood, to create a giant imitation of the burdock seeds. The tiny hooks turned into long wooden rods that you can stuck on several wooden spheres in order to create your giant burdock seed. Their soft touch of blue gives them a very design and elegant aspect. Pikado is a design toy that you can enjoy in many ways. It can turn into an artistic game of “pétanque”. Place one of them on the floor and keep the others in your hand. Take a few steps back and throw them, aiming at the Pikado which remained on the floor. Can you see how their wooden rods interlace to create a very artistic structure? No worries; Pikado is solid enough, and you can throw it at the floor without breaking it. 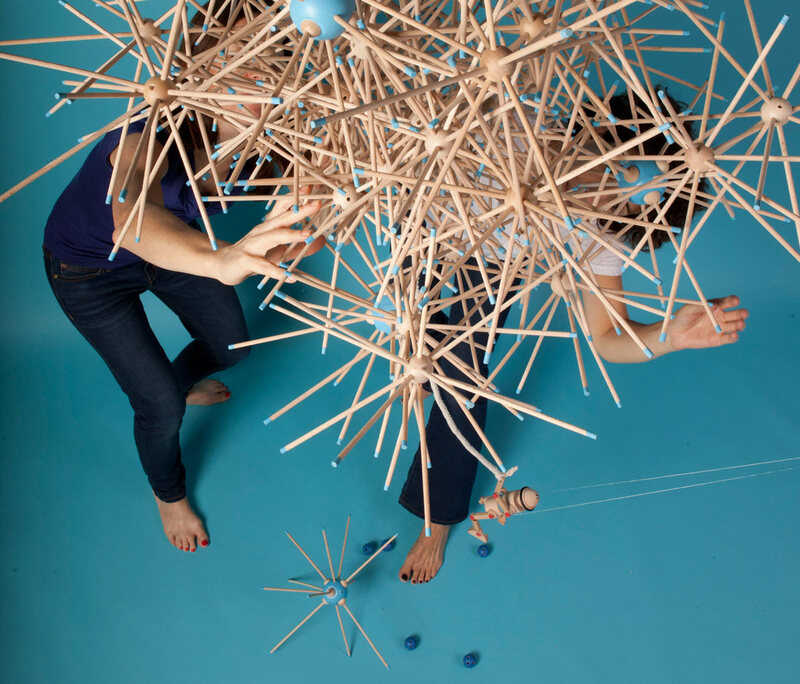 Kids will imagine many games with this playful sculpture. And, for grown-ups, Pikado turns into a very design decoration object that will intrigue your visitors… when they ask, you’ll tell them about the burdock seeds story! You liked Pikado’s story? Discover this funny game on our eShop ! The burdock seeds also inspired a great invention, which you certainly use every day… Want to know its story? Year 1941, Swiss Alps, a beautiful and quiet day of autumn. Georges Mestre, brilliant engineer of 34 years old, goes out for a hunt. Few hours later, he’s coming back home, following by his dog. That’s when he feels a tingling on his left arm. Indeed, there are little spiky balls that he recognizes immediately: burdock seeds. He tries to take them off, in vain: their little hooks seem stick to the clothes! Georges Mestre decides to observe those little plants with a microscope in order to understand how such a grip is possible. While he was observing them, he suddenly has an idea… Eureka! Georges Mestre had made a great discovery.